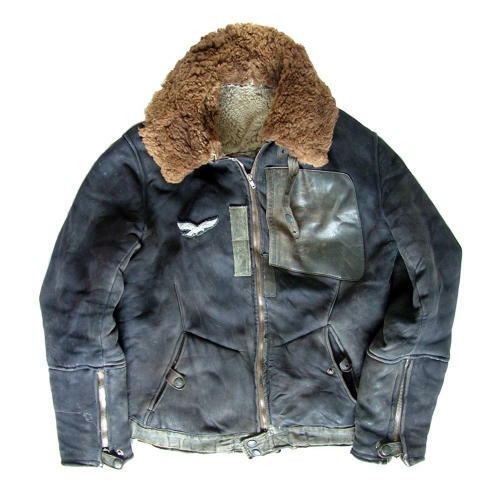 Winter weight 'Channel' jacket for use in flight over water. Measures approximately 48" at the chest (24" pit to pit laid flat). Constructed in blue-black suede shearling with a fleece lining and large cotton backed fleece collar. A single front zips runs from the waist to the neck and a narrow cotton canvas waistband closes at the front with 2 snap fasteners. Slash waist pockets, single leather map pocket at the chest and zipped cuffs. The overall appearance is reasonable. Much of the suede is in very good condition but there are substantial repaired tears to the right cuff area and a couple of smaller repairs on the back. In addition there is some restitching in the right armpit seam and other small holes here and there. The waistband shows considerable wear externally and has holes on the inside - see photographs. Some wear externally at the cuffs and the concealed inner cotton cuffs have been worn back to the wrists and are very ragged. The main zip is a replacement but both sleeve zips are original Rheinnedel brand. The lining is generally quite good but there is some wear and fur loss where the collar is attached. With original bullion wire wing. Certainly not without issues but this jacket displays well and is a relatively rare variant. More photos available on request. Stock code J22758.